This is the group of trees on the corner of the third branch driveway from the gate [we'll probably give these driveways names eventually] on the southern side of the main driveway (about 100 metres from the River Road entrance). It's bordered by the driveway to the north, the large oak tree to the east, an orchard and other plantings (Sector SE 30) to the south, and the branch driveway and a line of kalamata and picual olive trees along the western edge. 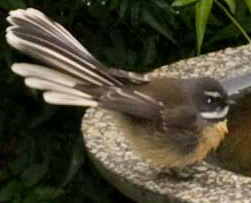 Like many parts of the garden, this area has a mixture of exotic and native New Zealand plants. 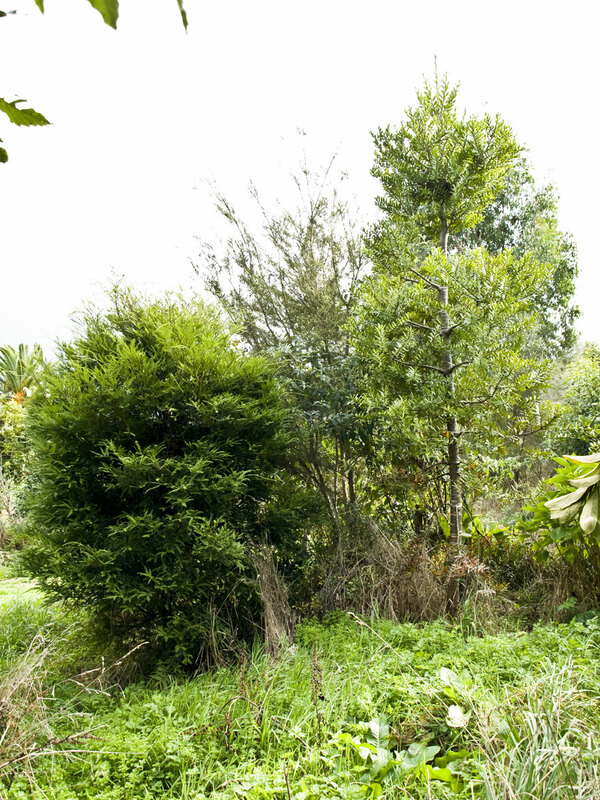 Four of the trees, miro (Prumnopitys ferruginea), kauri (Agathis australis), ake (Dodanaea viscosa), and kahikatea (Dacryocarpus dacrydioides), are part of the language garden (the first two are clearly visible in the photographs; there are several other kauri also in this area), their names derived from Proto-Polynesian *milo (inherited from Proto-Eastern Oceanic), Proto-Nuclear-Polynesian *kauli, Proto-Polynesian *ake, and Proto-Polynesian *kafika (inherited from Proto-Eastern Oceanic), respectively. 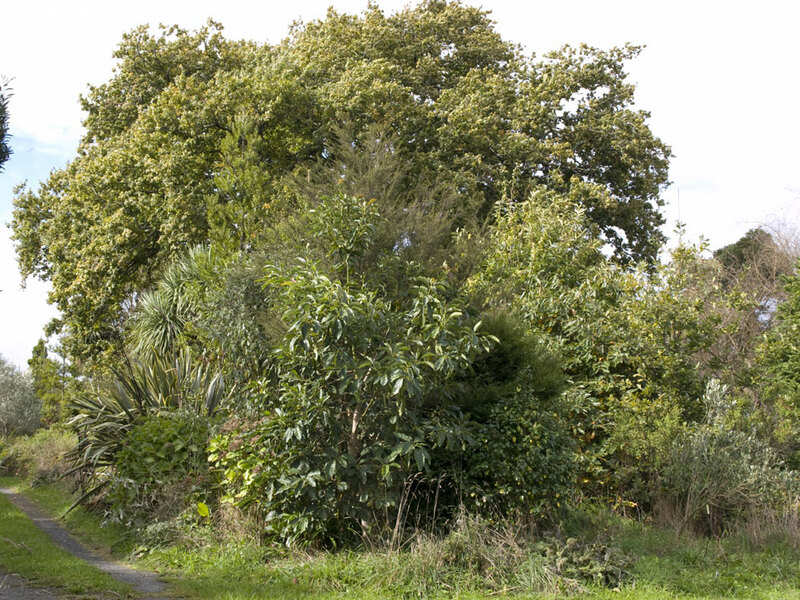 Other native trees and plants in this area are two tïtoki (Alectryon excelsum), harakeke (Phormium tenax) [another inherited name], and koromiko (Hebe sp.). Exotic plants include an avocado tree on the NW corner, a Camelia (in front of the miro), hydrangeas, a clump of large bromeliads (Aechmea sp.) 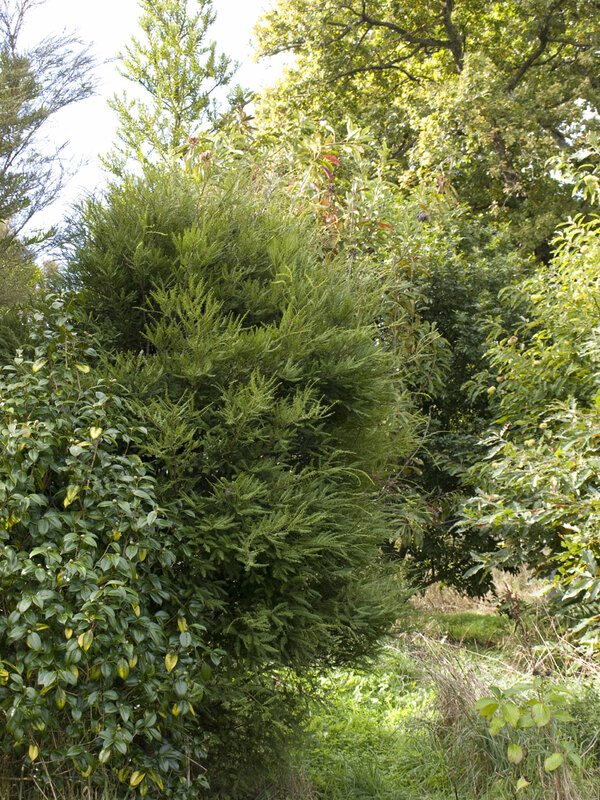 a chestnut tree and a Chinese fir tree (Cunninghamea lanceolata). 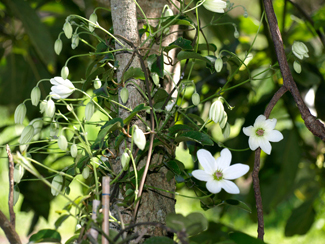 The avocado is the support for a puapua or pöhue vine, (Clematis paniculata, also known as pua wänanga) which is rapidly ascending through its branches. And of course there is the the huge oak tree (Quercus sp. ), a symbol of the utter destruction of this landscape by the invading British army in the 1860s, now towering in the background, but destined to become just one of many large trees, many from species which originally grew here, in this neighbourhood. 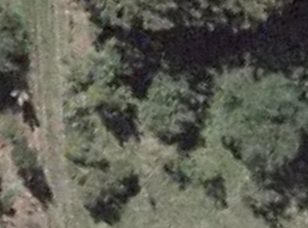 The text and aerial photograph on this page should not be copied or reproduced.The remaining photographs are licensed under a Creative Commons Attribution-Noncommercial 3.0 New Zealand License.